TOKYO (Reuters) - While U.S. President Donald Trump appears to wage a trade "Cold War" on China, Japanese Prime Minister Shinzo Abe will promote a thaw with Beijing at a summit this month where business ties will be in the spotlight. Japan shares U.S. concerns about Beijing's maritime assertiveness and is extending its military reach to counter China. Japanese firms worry also about Chinese violations of intellectual property rights and technology theft. Still, business ties with China, the world's second largest economy, are vital for Japan. "To ensure that Japan has sustainable economic growth, you cannot ignore economic relations with China," said a Japanese foreign ministry official, who spoke on condition of anonymity. Abe has met Chinese President Xi Jinping many times since their first chilly conversation in 2014 on the sidelines of an Asia leaders' summit in Beijing. 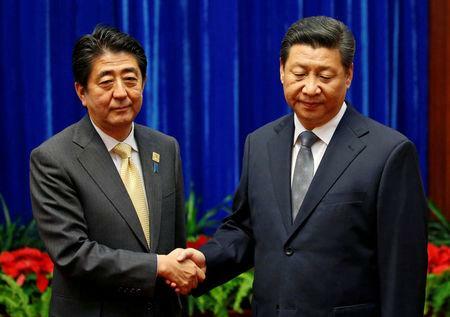 Abe's Oct. 26 meeting with Xi, officially confirmed on Friday, will be the first full-scale Sino-Japanese summit since 2011. Both sides hope more mutual visits will follow. The thaw has been linked to a shift in Beijing's diplomacy since late 2017 and increasing U.S.-China friction over trade. An executive at automaker Toyota, speaking on condition of anonymity, said the mood had changed from the "China risk" theme of the past few years. "The sentiment...is shifting very fast, leading to more for us to do in China," he said. China is Japan's biggest trading partner. Japan is China's second largest trading partner, after the United States, and fourth biggest investor. Japan's direct investment in China rose in 2017 for the first time in five years, a trend that continued in the first eight months of 2018, the Japan External Trade Organization said in a report that also flagged growing Japanese exports to China. A highlight of Abe's visit is expected to be a forum attended by up to 1,000 executives and trade officials to discuss China-Japan economic cooperation in third countries. "We really hope that Japan on this issue is not in vicious competition with China," said Wang Yiwei of Renmin University in Beijing. "It could be positive competition or even cooperation." Japanese participation could help Belt and Road's image and allay the fears of debtor nations, experts and officials said. Japanese defense officials are wary of its military implications, and Tokyo is pushing its Free and Open Pacific Strategy to promote free trade and infrastructure across Asia, Africa and the Middle East. "This is not 'support' for Belt and Road. We will not ease global standards," a Japanese trade official said. Such agreements "would be a symbol of improving ties," said Koji Sako, a senior economist at Mizuho Research Institute. Tokyo would thus balk at the sort of "poison pill" found in a new U.S.-Canada-Mexico free trade pact, Japanese officials said. "I can't imagine a situation in which we'd accept such a course," said another Japanese government source when asked about the poison pill provision. Many conservative politicians are deeply wary of China, as are many Japanese voters. A survey published on Thursday showed 86 percent of Japanese had a "bad image" of China. "There are some in Japan who think the security relationship with the United States takes precedence over Japan's economic issues," said Kiyoyuki Seguchi, research director at the Canon Institute for Global Studies. "But if one...asks whether economic development is possible without cooperative development with China, the answer is 'No'."